PORT JERVIS—Floyd Fredricks Jr. lived in a ramshackle hut on the banks of the Neversink River until some concerned people decided a veteran needed a hand up. A lifetime of bad luck had brought him to his lowly state. Fredricks grew up in Port Jervis. He joined the Marines and served his country honorably during the Viet Nam era. After his discharge, Fredricks worked several jobs but lost them one by one through serendipitous circumstances. His parents owed thousands in taxes on their home. When they passed away, he was forced to sell the house to cover outstanding taxes. He had no job at the time and had no place to live. “From that house, down to the woods,” he said. As he had done all his life, Fredricks drew on his inner strength and determination. His military training and natural talent for survival led him to live on the river. High school classes did not give Fredricks the skills he needed and wanted. Before graduation, he signed up for the Marines and completed boot camp training at Camp Lejeune, South Carolina. Fredricks said the Marines realized very soon that he had some serious skills in electronics. He was also a good shot. Because of high scores during training, he was given a choice of deployment. He chose Japan. In 1978 he was then sent to the Philippines during the Viet Nam War. He said he was sent from the Philippines to Vietnam. His job was to secure airports from enemy fire so people could safely leave the country. He was told this would not be on his record. The military then wanted Fredricks to do clandestine intelligence gathering. He does not say directly it was for the CIA. “They had a lot of trouble in a lot of places, and they sent us. It’s not on record anywhere.” He said he could not tell his wife about this service and will not discuss it even today. As a civilian Fredricks found jobs that seemed to end too soon. He first worked at the local shoe factory where his mother worked. The factory had been a stable employer for area residents for years but had been sold just before he was hired. Mismanagement and poor business decisions led to the factory’s closing. He then worked at the Ford plant in Mahwah, NJ. Although he wanted to work there until he retired, the plant closed a few years after he started. He then found a job operating a forklift at a company that he said was controlled by the Mafia. It, too, closed when the owners went to prison. He lived near his parents and, when his mother passed away, cared for his father at home. At the death of his father, the house was sold. Fredricks’ brother absconded with the money given to him to pay the taxes. Fredricks’ son was disabled and received some money from Social Security. He and his son decided to live on their own. 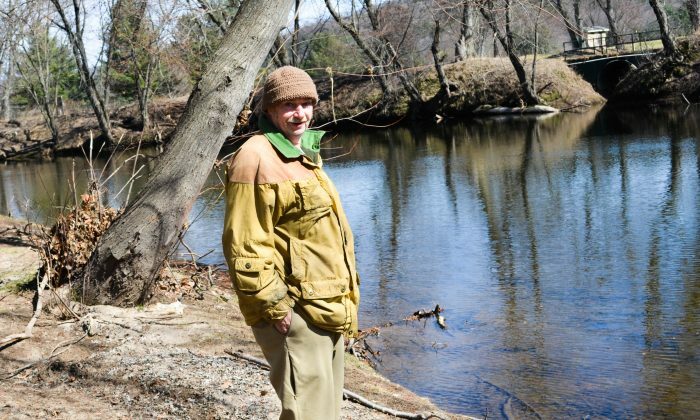 He knew every inch of Port Jervis and always liked to fish. He found a secluded spot along the Neversink and the two settled in. They built a lean-to with three wood-burning stoves. One stove was burning all day long, all year long. Fredricks’ main activity was chopping wood. Bernie Kean, who operated a moving company in Port Jervis and owned the land where Fredricks now lived, allowed Fredricks and his son to stay there. He was happy Fredricks kept the area clear of rubbish and garbage. Youth from nearby Port Jervis High School often came there to fish. Some stole from the shack where Fredricks lived. A report by the National Coalition for the Homeless reports that vets comprise between one-quarter and one fifth of the homeless. A third of homeless on the streets are vets. The Veterans Administration cares about homeless vets. Working with federal, state and local agencies and housing providers, the department works hard to find affordable housing options for homeless vets. Fredricks did not know where or how to get the help that he needed. Fredricks did not know where or how to get the help that he needed. County and local people got involved. Port Jervis Chief of Police William Worden came by regularly to check on Fredricks. County executive Steven Neuhaus, who is known for his high regard for veterans, got involved. Owners of the Waters Edge senior living complex in Port Jervis allocated an apartment. In January, Fredricks moved in. Bernie Kean helped him move his belongings from his shack and gave him furniture for his new digs. He was given a phone with 300 free minutes each month. “It was great to see the community come together to help Mr. Fredricks find a home,” said Neuhaus. To see them in the crowd was very moving to me. Through a lifetime of bad luck and ill fortune, Fredricks has remained genial and kind-hearted and keeps plugging on. “We don’t give up in our family,” he said.